Call Sparkling Creations by Sharon Newton to help you create beautiful memories. We’re your friendly, full-service florist proudly serving Bedias, TX and the surrounding area with over 30 years of floral design experience. 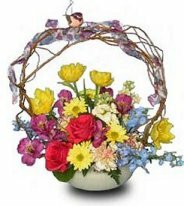 Choose from an assortment of high quality floral and gift items for all ages and occasions… birthdays, weddings, anniversaries, get well, new baby, holidays, bereavements, or just thinking of you. Our knowledgeable staff is ready to assist you with placing orders for local delivery or anywhere in the world. Not sure what to send? Let us offer some creative suggestions. The shop is open to serve your floral and gift giving needs: Tuesday through Friday 10 am to 5 pm, Saturday 10 am to 12 noon, and closed Sunday & Monday. Sparkling Creations by Sharon Newton is more than just your average flower shop! 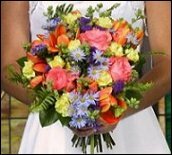 Wedding & Special Event Flowers ~ Whether you prefer a look that is timeless and traditional or sleek and contemporary, we design floral arrangements to reflect a bride’s individual style and budget. Call (936) 395-7673 to schedule an appointment for a wedding consultation and let our expert floral designers help you plan a truly magical event with gorgeous, unforgettable flowers! We’re your one-stop wedding shop! From invitations and napkins to tuxedos and wedding cakes, let us take care of all your details and we also have wedding and party rentals for your convenience. All Occasion Gift Ideas ~ Browse our variety of dish gardens, and green & blooming plants for a gift to liven up any room or office. Our unique gift assortment also includes: Circle E candles, beauty products, spiritual items, jewelry, silk floral designs, candies, cookies, plush toys, baby gifts, and more!